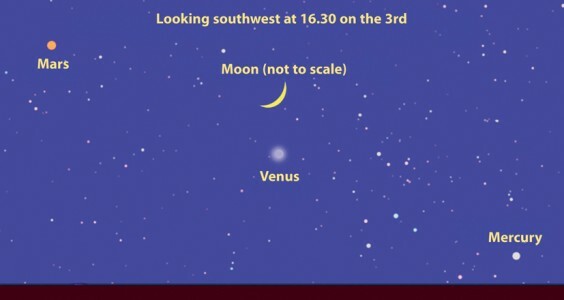 If you have been looking out just after sunset during the past month, you should have been able to spot Venus low in the south west, defying the daily movement of the rest of the sky. Well, this month it gets a lot easier to see as the Sun sets earlier and Venus gets closer to us, preparing to overtake us on the inside early next year. By about five o’clock it should be possible to spot our nearest neighbour, still fairly low in the sky and never moving far from its position in the southwest. Because of its low altitude and its relative brightness, it is often mistaken for an aircraft or even something more mysterious. See what you think. On the 2nd and especially on the 3rd, a very thin crescent Moon is close by, making a great spectacle. For the first half of the month, Mercury might be visible, very low in the sunset, but you will need a very good view of the horizon and to be looking as soon as the sun has disappeared from view. It’s always worth having a go. The fourth of the inner planets, Mars, is also still visible higher in the sky to the left of Venus. Looking more like a bright star, it has a distinct orange hue. The Moon passes close by the Red Planet too, on the 5th. Speaking of which, the Moon actually passes in front of Neptune this month, on the 6th. Of course, Neptune can only be seen with a telescope and even then with some difficulty but I thought I would mention it. While we’re here, the Full Moon on the 14th will be described as a “Supermoon”. This is because the Moon will be in that part of its elliptical orbit which brings it closer to the Earth. This means its apparent size is slightly larger than at other times (although this is the third one since the start of autumn). It’s actually just seven percent larger than an average full Moon. See if you can spot this massive increase in size. Far more interesting is the fact that, so close to the solstice on the 21st, the Moon will be as high in the sky as it gets and seems to be nearly overhead at midnight. If you are out and about at this late hour, have a look (taking care not to strain your neck!). If you’re up and about early on the 13th, you can see this bright Moon pass in front of Aldebaran, the red eye of Taurus the Bull, at about 5.30am. There are two scheduled re-supply missions to the International Space Station in December. A Russian Progress vessel on the 1st and a Japanese HTV on the 9th, so keep an eye on http://www.heavens-above.com for possible sightings . . . . and, of course, look out for a small red object crossing the sky on the night of the 24th!